The cul-de-sac village is located 35km northeast of Pécs and can only be reached through a single street. The village lies in a narrow valley of a little brook and is surrounded by steep hills which are covered in meadows and forest. These natural conditions have shaped the lives of the people of Ófalu. The family of Perczel settled new colonists in the region in 1740, because it had been depopulated after the Ottoman Wars. The first glass factories were built around 1760 by German settlers. Since Ófalu lies in a hilly and forested area, woodcrafts, for example woodcarving and building chairs, was the basic income of the inhabitants. The nickname “Hechtentapper” (local word for someone going through the hedges) for the people of Ófalu points to the thick vegetation around the village. Next to the country lane leading to the village from the east, a commendably renovated sculpture of Saint Wendelin can be seen. 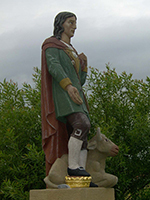 Wendelin is the patron of shepherds and the statue thus shows the importance of pasture economy and cattle breading in the village. According to the cenesus of 1910, the village had 800 residents back then. 53 of them were Hungarian and 747 German. The majority – 675 – were Catholic, the others Lutheran. Anton Pausch, a local wood turner, still maintains the tradition of wood carving in his workshop. 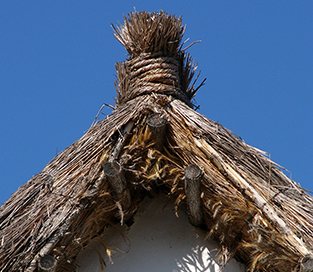 In the region, ornamented wooden beams hold the roofing on the corridor to the farmer’s houses, which is normally held by brick columns. In Pausch’s and other workshops such beams were and still are manufacturing. 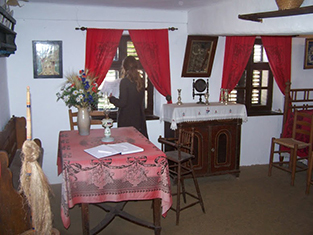 The museum of local history exhibits pre-war tools, furniture and interiors of kitchens and living rooms by local Germans. On the hill opposite of the museum on the other side of the brook, a simple Calvary and tombs can be found. 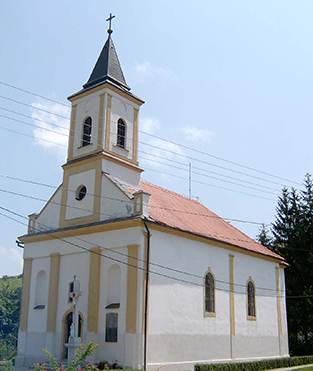 As soon as 1888, the inhabitants of Ófalu collected donations to build a church. Through their enormous effort the church was constructed in 1904 and dedicated to Saint Anton. When it is open, the little village tavern is worth visiting for a refreshment and an impression of the local German dialect. The church which was built in 1904. LEFT: Sculpture of Saint Wendelin, donated by Anton and Margaret Hein in 1872. 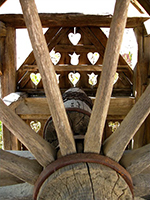 RIGHT: Rotating fountain with carved wooden structure, local history museum.